Manaslu Circuit OPEN after the earthquake 🙂 … but new road construction is degrading the experience. 100% of all bridges in good shape. 95% of guest houses in good shape. Many would argue that the Manaslu Circuit trail is the best general trek in the country, with colourful cultures and dramatic valleys against a backdrop of classic Himalayan peaks. raging rivers, precarious bridges and stunning mountain gorges. the shortest Circuit might be closer to 177km (110mi). It depends on your exact route, where you start and stop. And sidetrips. Andy Bryant’s GPS counted 212km. Manaslu Conservation Area covers 6 climatic zones! anyone of reasonable fitness can do Manaslu. It’s no longer an extreme trek. And it’s getting easier every year. food is surprisingly good. And inexpensive. electricity for recharging batteries is available at most lodges. And it’s often free. the altitude profile for this trek is excellent. You have enough time to acclimatize. very little gear is needed. You can easily get pack weight down to 10kg (22lbs). There are plenty of decisions to be made in advance of flying to Nepal. Buy a guidebook months in advance. do ONLY the Manaslu Circuit? … Or add the Annapurna Circuit and/or Tsum Valley? add extra days for sidetrips? Ganesh Himal Base Camp? Or Manaslu Base Camp? pay for food as part of your all inclusive payment to the trekking agency? … Or pay as you go? Manaslu is not inexpensive, but it’s more expensive than in the past. Many hikers run out of money. There is no ATM anywhere en route. your guide or trekking agency will organize your permits. You need to provide at least 4 passport photographs. the worst and most dangerous aspect is the 6-9hr bus ride from Kathmandu to Arughat Bazar. It’s easier from Pokhara. Alternatively, a 4WD jeep (6h) may get you there from Kathmandu more quickly but costs around $US150-220 for 4-6 people. the worst stop is Larkya Phedi (Dharamsala) which in 2013 offers 64 beds. It’s cold, dirty and crowded. In fact, every bed was full when we arrived. We stayed in tents as a back-up. Waterborne diseases are a big concern. Treat everything. Don’t trust that water used in cooking is safe. If worried, order a “sizzler”. Your meal arrives very hot, sometimes in flame. Order veg. Meat cannot be stored safely before cooking. bring a war, sleeping bag as the bedding in some guesthouses is unsanitary. We had bedbugs in one. Mice in several others. An inflatable mattress is a good idea too as mattresses are thin. be clear — you might have to QUIT if by bad luck or rushed ascent you suffer altitude sickness (Acute Mountain Sickness or AMS). We saw many hikers backtracking to the start in Nov 2013 — the Pass was closed due to snow for at least 2 days. In the end, for our 2013 trip, the 11 days (including tips) cost us about $500 total for each hiker. The highest price we were quoted was about $1000. Cheap on this adventure is $40-50 / day. Expensive is over $100 / day. One site quotes $1600-$4000. Starting 2014 you can pay with credit card or other major currencies. Traditionally, it’s considered to start in Arughat Bazaar, end in Besisahar. By 2013, however, some shorten that by catching a motor vehicle at the start. Or at the end. If you don’t want to walk on a road out of Arghat, consider a wilder trail via Lapu. Some take a longer route, starting from Gorkha Bazaar which is quicker to reach from Kathmandu on a smoother road. The only one we’ve used was a small outfit called Touch Paradise. Great prices. Straight answers. And they delivered on everything promised. Most trekkers fly in to Tribhuvan International in Kathmandu. The visa on arrival process is much faster and simpler than in the past. Bring visa photos with you, if possible, and you can apply with pen and paper. Alternatively, there are now machines for online application – the machine takes a mugshot photo. Let your trekking company and guide take care of the rest of your arrangements. Get your guidebooks in advance. Most of these other books are easily found in Nepal. The best bookshops in Asia are in Kathmandu. It’s now easy to buy maps in Nepal. Inexpensive and widely available. This 5min edit gives a very accurate overview of what you’ll see on this adventure. Click PLAY or watch it on YouTube. Click PLAY or watch Andre’s mountains highlights on YouTube. Click PLAY or watch climbaddict on YouTube. I carried my own light tent as a back-up plan. Nobody else in my group did, however. Super awesome website with incredibly useful information! Thank you. 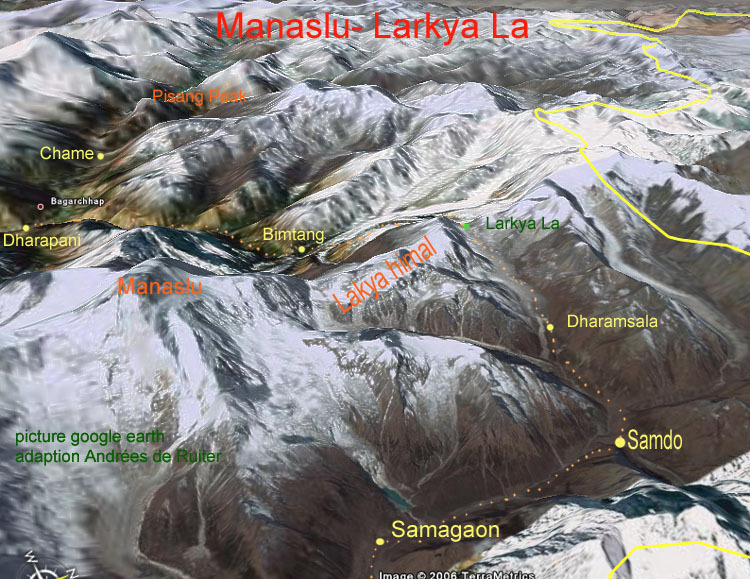 Trying to decide between Manaslu and Everest 3 Pass hike for mid-April 2015. Which would be your preference? Also, I’m sure it’s preferable to have waterproof shoes, but do you think it’s necessary this time of year? I’ve been traveling for awhile and chucked my hiking boots awhile back to minimize my pack. Without question I’d say go Manaslu now. Before it gets too crowded. The downside is that Manaslu requires a Guide, while Everest can be done independently or guided. Time is another factor. You could do Manaslu easily in 2 weeks while you’d want at least 3 weeks for Everest. Whichever you choose, it will be fantastic. Sanjib picked us up from the airport when our flight arrived 12.4.2015. He took us to our hostel, and visited us again the next morning, taking us to various places to get final provisions prior to our trek. His office is very nice and he served us tea. He picked us up the morning of our flight to Lukla. Upon arrival in Lukla, we met our porter and we had breakfast. The cost of our trek was extraordinarily competitive and everything was included. The only thing I had to pay for was if I wanted something like a candy bar while trekking–and then only if it weren’t a scheduled meal or break. I honestly feel we had the best deal available for this trek in Nepal. Sanjib commands a certain amount of respect from the Nepalese and other guides. He is very tall and in excellent shape. He seems known by everyone on the trail, from the teahouse owners to the other guides to airport personnel. It seemed as if he arranged everything in advance, getting us excellent lodgings in teahouses. Each of our dinners came with pomegranate seeds and tangerines–but no one else in the dining area had these. To this day, I don’t know where Sanjib found this stuff. My travel partner and I are 57 and 53 years old respectively. Sanjib did not push us to make our miles in any amount of time. It was a leisurely pace, although still very difficult. He explained many of the sites and cultures. He knew everything it seemed. His English was good enough where we had absolutely no problems with communication. Sanjib has an excellent sense of humor, and even with the extreme difficulty, I found something to laugh about daily. On the day from Tengboche to Lobuche, I ended up very ill. I couldn’t even carry my pack. I would say this is one of the sickest I’ve ever been. When we reached Lobuche, I immediately laid down under two sleeping bags and two huge wool blankets. I could not get warm. I had no appetite. Shortly after, Sanjib appeared with a bowl of porridge and cup of tea. He very calmly but sternly explained that it was necessary I choke this down if I had to. He left. I choked it down, and within 1/2 an hour, my strength began returning and I started tow arm up. The next day I woke up about 80% of my usual strength, able to continue on to Gorekshep. It wasn’t until later I found out we were headed out in a helicopter the next morning if I woke up in the same condition. On our descent, while in Namche, the earthquake struck. This isn’t a review of the earthquake, so I’ll say no more about that event. Sanjib decided, along with my travel partner (I was overruled) to head out the next morning to Phak Ding. The trek to Phak Ding was treacherous, with earth clearly waiting to slide off the mountain. We reached a landslide area that destroyed the trail, so we had a vertical climb up and around this landslide. The ground we had to climb was very loose and I was fearful it would not hold our weight. Sanjib made steps with his feet, after taking my pack, and assisted me with getting to the top. I was fearful, knowing I left a kid back at home. A half hour after we got off the trail, a 6.9 aftershock occurred. Sanjib had insisted we be off the trail by noon because of “tales” of another earthquake. I told him that was superstition and he should not worry. He said ok, but we need to hurry up and get off the trail. The 6.9 aftershock occurred 12:30. Upon arrival in Lukla, so many people were waiting to get out of the airport and back to Kathmandu. Our flight was cancelled, so we were now at the end of the line of hundreds of trekkers trying to get out. We were looking at that time at a good one week delay. Somehow, and he has not told me how this happened, he got us on the first flight out on the day after we were scheduled to leave. People who trekked the same time as us were stranded for up to two weeks. We were delayed one day. You tell me what kind of pull Sanjib had, to get us out of Lukla only one day later. When we arrived in Kathmandu, our hostel was closed because of damage. Sanjib found us a very good high rise hotel at a very reasonable cost who took us in. He visited us everyday until we left. I owe this guide my sincere thanks for the best trek we’ve ever taken–and we are world trekkers–and for in all likelihood, saving our lives. I cannot wait to again visit Nepal and visit Sanjib Adhikari. Thanks for the update on Manaslu. I am looking for a Manaslu trekker from 22,Sep. or 23, Sep.2016. Hey, this website is really great with many useful links. It helped me greatly for my research before I went on my Manaslu Trip last year in Sept-October 2017! It might contain some more updates about the circuit in 2017. Thanks!! You guys have great information too! I have found several website written about manaslu and among them, https://www.aroundmanaslutrek.com/ is a good one. I think it would help you if you are thinking of making your trip to manaslu circuit. Top notch and detailed information that you have shared on this blog. Hats off! In our recent blog post, gather Manaslu Trek cost information. We have divided the cost into eight categories which will be an ultimate guide to Manaslu Circuit Trek cost.